Homemade bagels are very different from store-bought bagels, which are too doughy for my taste; I always end up scooping out the center. This recipe, which I have truly labored over, produces bagels that are lighter and crisper with infinitely more flavor. I’m really quite prejudiced since I have worked on these bagels for many years, perfecting the shaping process. I’ve learned, through a lot of trial and error, that the secret to creating and keeping the correct bagel shape through rising, boiling and baking is to make the hole disproportionately large, when shaping. Because the bands of elasticity are so strong (because the flour used is so glutinous), the shaped dough has a tendency to rise up, not out. This can cause the hole to disappear if too “appropriate” looking at the onset. I prefer to use “super-gluten” flour, which I purchase at my neighborhood pizza place. If unavailable, use the bread flour I’ve linked to, which is what I prefer for some of my other types of bread. As for texture, the choice is yours. The chewiest bagels are made with just water, but the taste is a bit richer with milk; a combination of the two will also produce a fine bagel. 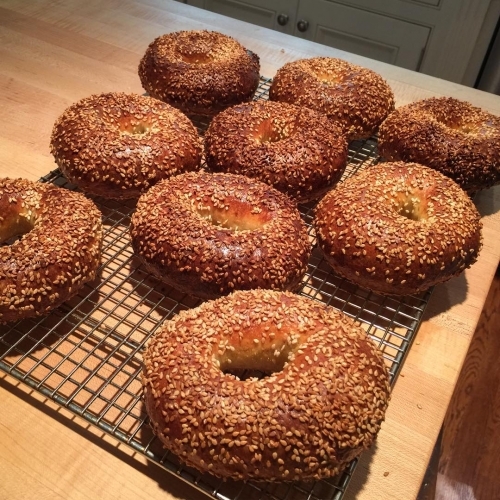 Using liquid barley malt extract instead of (or in addition to) sugar in the dough also gives bagels their unique hint of sweetness (and yeast just loves barley malt!). Look for it in gourmet or health food stores. And for best results, I bake my bagels on a large clay stone, but you can use a dark steel baking sheet instead. Please don’t be afraid to try this recipe; I’ve already made all the mistakes for you! If making yeast bread is new for you, you can go to this page on “Food Matters A to Z,” to learn about how things work. You can also check out the previews of my Pizza video and/or my Country White Bread video to see if you’d like to watch them in their entirety. And, finally, to read my blog, which has lots of detailed “bagel making” photographs, click here. Brush the interior of a 5-quart mixing bowl with melted butter and set aside for rising the dough. If using milk, heat in a medium-sized saucepan over medium-low heat until just warm throughout. Pour the milk into a large mixing bowl and add shortening and 1/2 cup lukewarm water. (If the milk became too hot, let it cool until just warm.) If not using milk, pour the 2 cups lukewarm water into a mixing bowl and add the shortening (no need to melt). Dissolve the yeast in 1/4 cup lukewarm water with a pinch of the sugar. When yeast is creamy and starts to bubble, add to mixing bowl with 2 tablespoons of the sugar or the barley malt extract, salt and black pepper, if using. Briskly stir in enough flour, a cup or so at a time, to make dough that is not easily stirred in the bowl. Turn out the dough onto a floured wooden board and knead in a brisk push, fold and turning motion, until smooth and elastic, about 5 minutes. Add only as much additional flour as necessary to keep dough from sticking to your hands and work surface. As always, use a pastry scraper while kneading to scrape dough off the board cleanly as you continue to knead in a sufficient amount of flour. Place the dough in the buttered bowl. Brush top of the dough with more melted butter, and then cover with buttered plastic wrap and a clean kitchen towel. Let rise in a warm, draft-free spot for 1 hour (or up to 2 1/2 hours for an extremely light and flavorful bagel). Uncover bowl and punch down dough with several swift swats with the back of your hand. Recover bowl and refrigerate dough for 4 hours or, preferably, overnight (and up to two days!!). Position the rack to the lower third of the oven. If using a large pizza stone, place it on the oven rack and sprinkle a baker’s peel generously with cornmeal and, if desired, a combination of seeds (poppy, sesame and caraway). Otherwise, brush or spray a large dark steel shallow baking sheet with vegetable oil and sprinkle the interior as described above. Place an (empty) heat proof pan on the rack underneath the tiles or stone. Preheat oven to 500º F at least 30 minutes before you plan to shape, boil and bake bagels. (If working with a double oven, preheat the second oven as well). Pour the prepared egg-white glaze through a small medium-mesh sieve into another bowl to remove excess coagulation. Set the glaze next to your work surface. While the oven preheats, bring one or two large pots of water to a rapid boil. Lay a clean kitchen towel on each of 2 shallow trays or baking sheets (for 10 bagels) and sprinkle the towels lightly with flour. Remove the dough from the refrigerator. Punch the chilled dough down, with several swift blows, until totally deflated. Turn dough out onto a lightly floured board. Using the blade of a pastry scraper, divide the dough in half. I recommend baking only 5 bagels at a time (per oven) so each has enough space around it to bake properly. If not working with a double oven, place half of dough back in bowl, cover and refrigerate. Divide each half of dough into 5 equal pieces (for 10 in all). You’ll work with 1 piece at a time, keeping the remaining pieces covered with a towel. Shape one piece of dough into a very tight, round ball by drawing dough up and pinching it at the top. Keep pinching and pulling upward, always keeping ball on a lightly floured board to prevent sticking. The ball should be perfectly round with the exception of a little knot of pinched dough on top. Turn ball (knot side down) and flatten gently. Push your index finger through the center of dough (right where the knot was). Gently stretch the hole, while being careful not to tear the rim, until hole measures about 2 to 2 1/2 inches in diameter (the hole will shrink after rising and baking). As each bagel is shaped, place it on the prepared towel-lined trays spaced 2 inches apart. Cover bagels with another clean towel. Just before baking, place the ice cubes and a few tablespoons water into a cup and pour this into the pan that sits below the baker’s stone. If using tiles, place baker’s peel all the way to the back of the hot oven and with a swift jerk; remove the peel, leaving the bagels on the hot tiles (or place baking sheet on hot oven rack). Reduce oven temperature to 450o F and bake for *25 minutes (see note); turn oven off and allow bagels to sit there for 5 minutes. Open oven and allow bagels to sit in oven for 5 minutes more. Remove bagels to wire racks when uniformly golden and crisp. Cool thoroughly before storing. Store cooled bagels to be served on the day of baking in a paper bag. Store the remaining bagels in a jumbo-sized, heavy-duty plastic bag, at room temperature. Bagels also freeze well in well-sealed freezer bags. To thaw, remove from the freezer the night before and allow bagels to thaw, overnight, in the sealed bag.